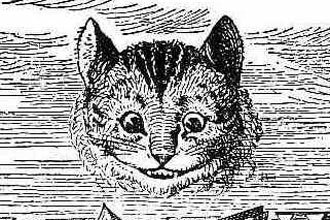 This picture of the Cheshire Cat is the original drawing for Lewis Carroll’s book “Alice’s Adventures in Wonderland” by Sir John Tenniel in 1865. The Cheshire Cat appears and disappears at will, engaging Alice in amusing but sometimes vexing conversation. He constantly grins and can disappear and reappear whenever he likes. Sometimes it disappears and leaves its grin behind. The Cheshire Cat is the only character in Wonderland who actually listens to Alice. The Cat plays an important role in Alice’s adventures as he instructs her in the protocols and rules that govern that strange and colorful place. He can also talk like a human. In fact, he carries very engaging – though thoroughly annoying – conversations with Alice. The following is one of the best-known passages of this beloved book. At first glance, it may seem as if what the Cat says makes no sense. But when you read it a second time, you can see the wisdom behind the Cat's words. "That depends a good deal on where you want to get to," said the Cat. "I don't much care where---" said Alice. The following conversation is also well-known. Once again, you get to savor the Cheshire cat's profound wisdom... You are where you're supposed to be... according to the Cat. "And how do you know that you're mad?" "I suppose so," Alice said. "Well, then," the Cat went on, "you see a dog growl when it's angry, and wag its tail when it's pleased. Now I growl when I’m pleased, and wag my tail when I'm angry. Therefore I’m mad." Another notable encounter happens when the Cat suddenly appears at the Queen’s Croquet Ground. Alice is happy to see him. When sentenced to death he baffles everyone by making his head appear without his body, sparking a massive argument between the executioner and the King and Queen of Hearts about whether something that does not have a body can indeed be beheaded. It is not 100% clear why Carroll named this character 'Cheshire Cat'. "To grin like a Cheshire Cat" was a common phrase in Carroll's day. Its origin is unknown, but it may have originated from a sign painter in Cheshire, who painted grinning lions on the sign-boards of inns in the area. Another source may be the following: when you take a good look at the 'Alice Window' in Christ Church, Oxford, you can see 3 grinning animals at the top of the Liddell's family arms. Perhaps this is what inspired Dodgson. Also, at one time, Cheshire cheeses were molded in the shape of a grinning cat.